As you may know I’ve been busy lately inspecting the Windows Phone 8.1 internals. Last week I discovered some new Cortana personas. Now I’ve uncovered some new and, as far as I know, currently undocumented URI schemes. These can be used to launch certain apps and System Settings pages directly from within your own app using the LaunchUriAsync() method. ms-battery Launches the Usage tab of the Battery Saver app. ms-settings-camera Launches the Photos + Camera Settings app. ms-settings-networkprofileupdate Launches the Network Profile Update app. ms-settings-notifications Launches the Notifications + Actions Settings app. ms-settings-workplace Launches the Workplace Settings app. 2 I didn’t insert a SIM card into my the Windows Phone 8.1 phone I was testing this with, so all I got was a page containing a ‘SIM applications aren’t available right now’ message. Disclaimer: As these URI Schemes haven’t (yet) been publicly documented by Microsoft, you probably aren’t supposed to use them. They could have been provided for internal/carrier/OEM usage or maybe they will be documented at a later date. In short: no guarantees! In fact, using these may even cause your app to be rejected from the Store. Posted on April 28, 2014, in windows phone, Windows Phone 8.1 and tagged undocumented, URI Scheme. Bookmark the permalink. 8 Comments. If you find a way to go to start+theme , I will love you. Maybe as a developer, he wants to offer a one button click to take the user there, allowing them to enable a feature or something that his app relies on? Rather than putting the burden on the user to navigate there in your 3 steps, or a less efficient person’s 10 steps, and forgetting what settings they were looking for in the process? 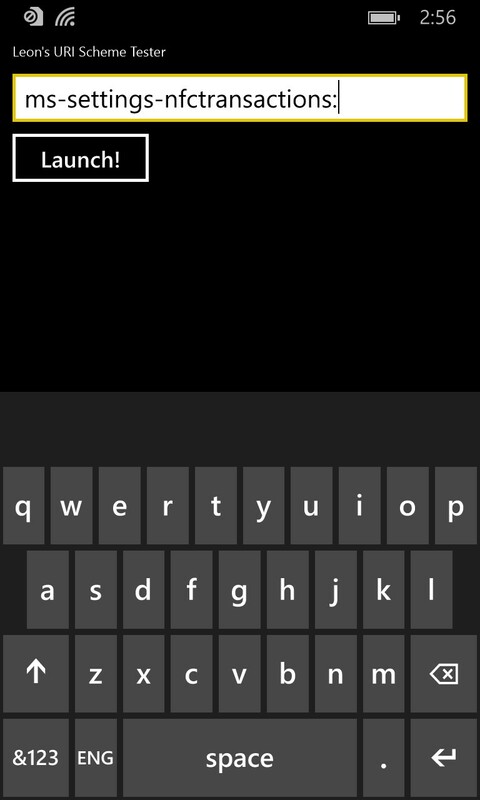 anything for launching the Store on windows phone 8.1?? Nice research! Do you know of a way to open the Glance settings? I was trying to locate URI for OneDrive (SkyDrive)…Anyone knows it?